After purchasing, I read the reviews. Someone stated it is very small which is true, but its really pretty and petite. It's also a promise ring, but still very pretty. Beautifully crafted from sterling silver in a delicate style, this gorgeous ring from Miadora will add a sweet but refined touch to your look. 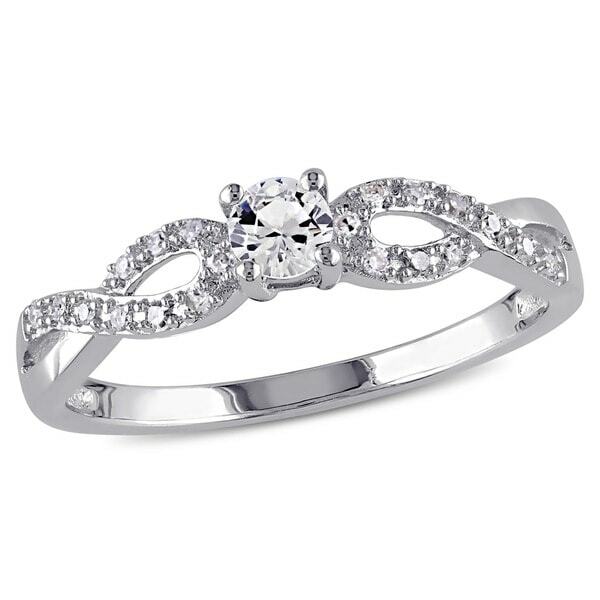 The ring features a lovely, created white sapphire, prong-set over a graceful infinity band. Shimmering white diamonds line the shank, adding a hint of glittering appeal to this sumptuous ring. My boyfriend gave this ring to me a promise ring and I love it! First things first, this ring is SMALL. If you don't have slim fingers then this is not the ring for you. Unless you want a really small ring. I have a pretty small hand and it is a PERFECT size. The white sapphire in the middle is absolutely gorgeous and shines brilliantly. The diamonds on the band are TINY!! To be honest you can hardly see them and they seem to be a little cloudy. But, in the right light they do sparkle :) Overall this a nice little ring, and you can't beat the price! Excellent sparkle and style to the Miadora Sterling Silver Created White Sapphire and 1/10ct TDW Diamond Infinity Promise Ring. I am not using it as a promise ring. I just love the look. My boyfriend presented me with this ring for our engagement, and it is absolutely perfect! This is the kind of ring for a girl who isn't into super flashy jewelry or ginormous rings! It's small, very elegant, and the sapphire is gorgeous! I love it! This ring is gorgeous. So dainty! Perfect size for a teenage girl to wear as a purity ring. I would buy one for myself if I didn't already have a wedding set I love! Shipping was super fast and delivered before Christmas. I would highly recommend this ring to anyone looking for an engagement ring, purity ring, or just something pretty to wear. I love love love this ring, it meet my expectations and more. it is very brilliant in shine and the sapphire is very clear. I purchased this ring as one of the gifts we gave our daughter for graduation from high school. 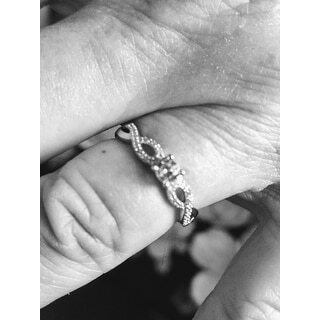 I picked this ring because of the infinity symbol on either side of the stone as a sign of our infinite love for her. It is a very pretty ring &amp; she loved it. I received my rings, I absolutely love them. My Miadora Sterling Silver Promise ring it's gorgeous. Price is great too. I would recommend this to anyone. Beautiful in person, size is perfect. I purchased this for my girlfriend as a promise of engagement ring and she just absolutely loves it! I don't currently have a photo of it on her finger. It works out perfect for her because she has a size 4 ring finger and the smaller stone looks great!! Very cute ring. Perfect for someone with dainty hands or someone who doesn't like the weight of bigger rings. I'm only taking off a star because it's not as sparkley as the picture shows. Less clear than pictures, but still a nice ring. I love this ring it is so pretty, I will buy another one soon! We purchased this as a purity/ promise ring for our daughter. The ring arrived today and our daughter loved it unfortunately it is way to large for her. Her other rings are size 7 but this one fall off the second she tried it on. Hopefully they have a smaller size available. this ring looks very cheap. It is pretty and simple.